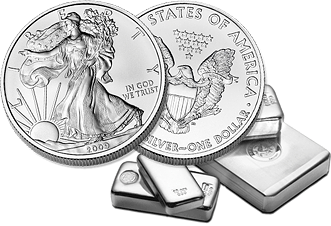 It’s easy to get caught up when looking to buy silver online in the major silver coin programs. The Silver American Eagle and Silver Canadian Maple Leaf coinage dominate the landscape in precious metals, but there are countless other products available out there today from various mints. If you look hard enough while buying silver, you might find coins and rounds from corners of the globe that might astound you. Among the smallest nations to have silver coin programs struck and issued in their name are the Solomon Islands. 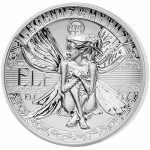 Throughout 2016 and 2017 a stunning series of silver coins emerged from the South Pacific Ocean island nation. The series included five beautiful designs on 2 oz silver planchets. 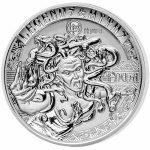 Explore the Legends and Myths collection online at Silver.com today! 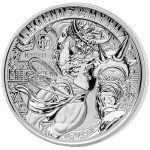 All of the coins in the silver series of Legends and Myths coins feature designs honoring some of the most well-known legends and myths from human civilizations over the course of thousands of years. The designs range from creatures inspired by human imagination to human figures feared and loathed by civilizations afraid of powers they couldn’t understand and tricked by those who pretended to know. Individual coins ship to you inside of a circular collection box with glass lid. Numbered Certificate of Authenticity included with each coin purchased. 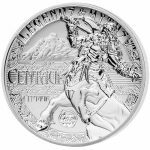 Mintage limited to 1,500 coins per design! Bears an individual face value of 5 Dollars (SBD) backed by the Solomon Islands. Reverse includes the image of a mythical or legendary being. That right-profile portrait of Queen Elizabeth II is one that serious coin collectors and investors know well. It is the fourth-generation image of Her Majesty crafted in 1998 by Sir Ian Rank-Broadley. It replaced the 1984 third-generation design from Raphael Maklouf on all British and commonwealth coinage, and has since been replaced on British coinage by Jody Clark’s 2015 design of the fifth-generation portrait of the Queen. Solomon Islands coins and other commonwealth areas still use Rank-Broadley’s design. Each of the silver coins for sale in this collection come with a double-high-relief striking that brings visual brilliance and enhanced 3D detail to each of the design features in the release. More importantly for the visual appeal, these silver coins are reverse proof specimens. A reverse proof coin has deeply-mirrored, clear design sets with a strong, frosted matte finish to the background field of the coin. The reverse proof striking adds visual contrast and overall beauty to the coins in this collection. 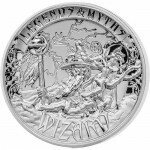 Now let’s take a closer look at each of the five designs in the Legends and Myths Series! 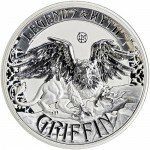 The Griffin, also spelled griffon or gryphon, is an ancient creature whose mythological roots go back to the Ancient Egyptians. The people of Egypt viewed the Griffin as the most powerful of all animals in the world. Its likeness was used to guard priceless possessions and treasures of the wealthy, and was viewed with great reverence in Western societies following the rise of modern Europe. A Griffin is considered the king of all beasts because it has the body, tail, and back legs of a lion, which is the king of beasts. However, it also has the wings and head of an eagle, which is widely regarded as the king of all birds. The reverse design includes a Griffin standing atop a pile of rocks ready to launch itself into the air and exude the power it holds over all animals. For the second release in the series, you find the image of a mythical creature that is half beast and half human. The myth of mermaids has proven pervasive throughout human societies in all corners of the globe. They are often linked to natural disasters such as floods and storms, but also attributed among ancient sailors to unexplained shipwrecks and drownings. In some cases though, there are those societies that view mermaids as benevolent creatures that seek to help mankind find love, and do not exist to harm. The reverse of the Mermaid coin includes the image of a beautiful female mermaid. Her figure is depicted as she leans against an open treasure chest that has washed up amidst the tide. She holds a bouquet of flowers in her left hand, and has the stereotypical torso of a female human but the lower extremities of a fish. 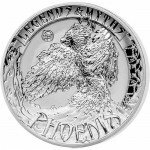 Third in the release schedule, and the final coin offered in 2016 in the series, is the Phoenix coin. Not your average dusty, desert city, the mythical Phoenix is a bird that represents the cyclical regeneration of life. In the case of a Phoenix, it is often featured rising out of flames or ashes from the death of its predecessor to bring new life. The reverse of the Phoenix coin in this collection depicts just such an occurrence. The mythical bird, said to be incredibly rare, ascends upward from the ashes of its predecessor to bring life anew to the world. 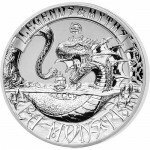 The first release of 2017 and the fourth in the series captures the image of a legendary sea monster. For as long as mankind has traveled the open oceans, our fear of what lies beneath has captivated our imaginations and struck fear in our souls. Over the course of thousands of years of seafaring culture, around the globe, mankind developed sea monsters in their minds to explain the unexplainable at sea. Sea monsters take many forms depending upon the nation and people that develop the myths behind them. The kraken, a giant octopus-like beast, is arguably the most popular sea monster in the world. Sailors from the Vikings in the North Atlantic to the pirates of the Caribbean swear to have seen this disastrous beast destroy ships. The reverse of the Sea Monsters coin includes the image of a haunting beast as it emerges from the sea to engulf a ship in its entirety. For this particular design, as massive dragon-like beast appears that is many times larger than the ship itself which it is attacking. Finally, the fifth release focuses on the myth of wizards in human society. Although not always viewed with the same negative light, wizards are actually what one should call the male version of a witch. While witches are almost universally viewed with fear and condemnation, wizards are viewed as either evil or potentially good depending upon how they use their powers. The tales of King Arthur tell of a wizard known as Merlin who has supernatural powers and used them to help advance King Arthur’s life and goals as King of England. Many wizards are depicted in the form of wise old men, often acting as mentors such as Merlin did with King Arthur. However, a wizard is, generally speaking, anyone who uses magic derived from a supernatural, evil, or occult source. On the reverse of the Wizard coin you’ll find the image of a wizard. Whether or not he uses his powers for good, this wizard is indeed menacing with a long beard and powerful staff in his right hand that appears to be sending lightning bolts out around his frame. The Solomon Islands are a collection of islands numbering more than 900 in total, with six major inhabited islands, located in the Oceania region of the world. The Solomon Islands are set east of Papua New Guinea and northwest of Vanuatu. The islands are said to have a population of 642,000 and were originally settled in 30,000 BC by Papuan-speaking seafarers. Over time, Austronesians arrived (4,000 BC), followed by Polynesians (1200-800 BC), and eventually Europeans. The English-language name for the islands comes from Spanish navigator Alvaro de Mendana de Neira. He stumbled upon the islands traveling from Peru in 1568 and found a culture in place that was notorious for headhunting and cannibalism. He named them the Islas Salomon, translated as the Solomon Islands, after the biblical King Solomon. For centuries this gave outsiders the impression the islands were filled with natural wealth due to King Solomon’s wealth in biblical tales. When you purchase Silver Solomon Islands coins online at Silver.com, you’ll find a number of payment methods available to complete your transaction. We accept most major credit and debit cards, as well as paper checks, Pay Pal transfers, and bank wire transfers. Credit and debit cards have a maximum purchase of $5,000 and generally take one business day to process. If you have any further questions about Silver Solomon Islands coins, please don’t hesitate to ask Silver.com. Our associates are available on the phone at 888-989-7223, or you can connect with us online using our live web chat and email features. You can also check the latest silver prices on our homepage at any time!